The most powerful waves along the Wild Atlantic Way stretch from Donegal Bay, through County Sligo and into County Mayo at Erris Head. This is known as the Surf Coast and is well known amongst surfers as a world famous as a big wave surfing destination. Here you’ll also discover great destinations for walking to suit all levels, traditional music and a whole host of Irish heritage, with many sites here dating back to over 5,000 years ago. The way to Mullaghmore Head passes through Mullaghmore where Eithnas by the Sea Seafood Restaurant is located. 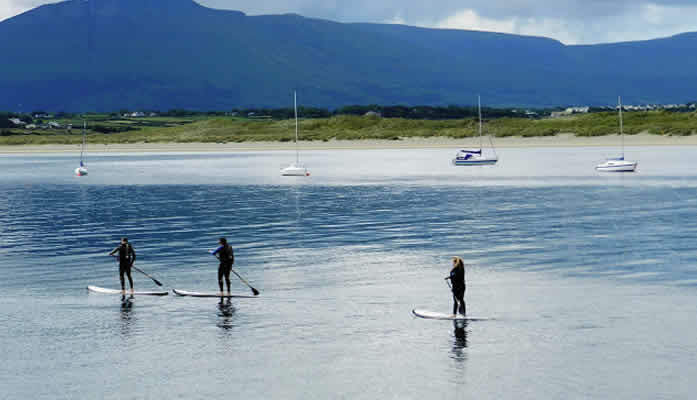 Mullaghmore is a stunning beautiful holiday destination with a picturesque sandy beach and pier. Boats depart from here for the monastic settlement of Inishmurray Island. Looking inland, you will see a magnificent view of Classiebawn Castle, in front of Benbulben mountain which dominates the backdrop. See also National Geographic Article ‘The Best of Ireland’s Wild Atlantic Way’ featuring Eithna’s By The Sea Seafood Restaurant Mullaghmore, Sligo. 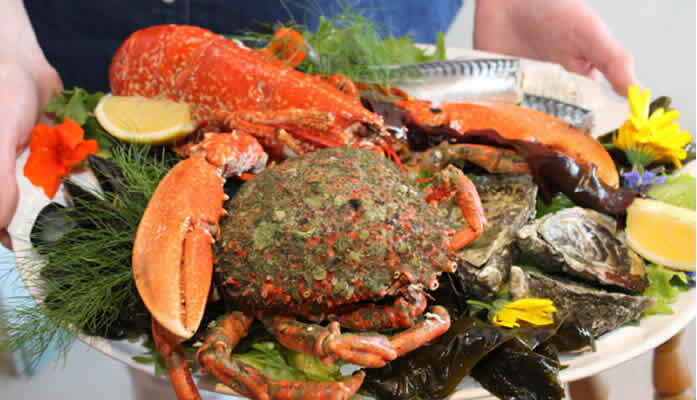 Work up an appetite for delicious seafood, shellfish and surprising seaweed dishes, served in the award winning, cosy family seaside restaurant, Eithna’s By the Sea, where everything from the décor to the warm welcome is generated by Eithna’s committment to place, community and to promoting excellence of our sea and seashore through food and local heritage. Simple local food superbly cooked with tales to tell about the area from the legendary Joe Mc Gowan, storyteller, author, and dedicated preserver of Ireland’s and Mullaghmore’s disappearing traditions and customs, happily shares his knowledge of local lore, telling the stories in his unique way, whilst taking you through a journey in time to the Mullaghmore of today gathered around the tables at Eithnas, or touring through the village. 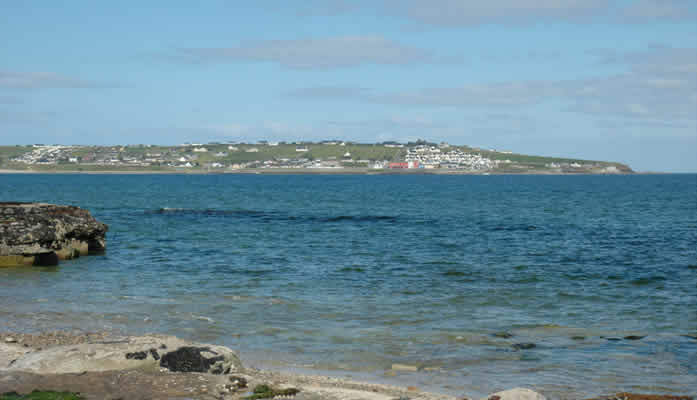 Take a plunge into the Bishop’s pool, a deep natural rock pool so called because it is shaped like a bishop’s crozier and enjoy the spectacular views of Donegal Bay. Sligo Food Trail treats your palate to an abundance of culinary treasures. You can map your own route to choose the cuisine that you love best. Producers and Food Trail members take pride in giving you fresh, local, healthy, (and very often) organic food that nourishes your body while the scenery nurtures your soul. As you drive through Sligo, you’ll witness the outstanding landscape which yields the fresh ingredients that create its exceptional cuisine: the lush green fields, the majestic mountains, the charming farms, the salmon rivers, and the mighty Atlantic Ocean! 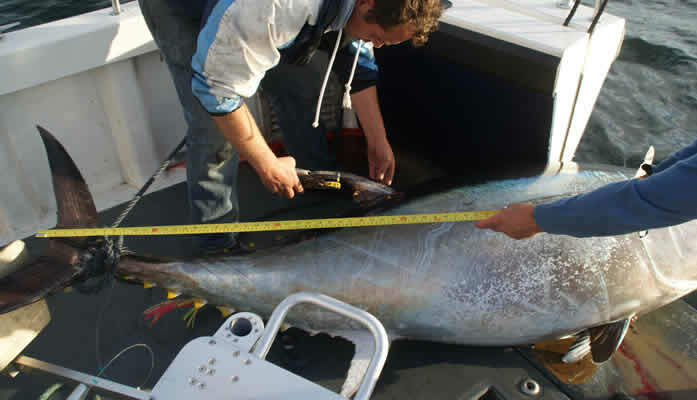 Sligo’s idyllic location on the Wild Atlantic Way means you can enjoy freshly-caught fish in any local restaurant. Click here for Eithna’s Food Experience amongst others to choose from. 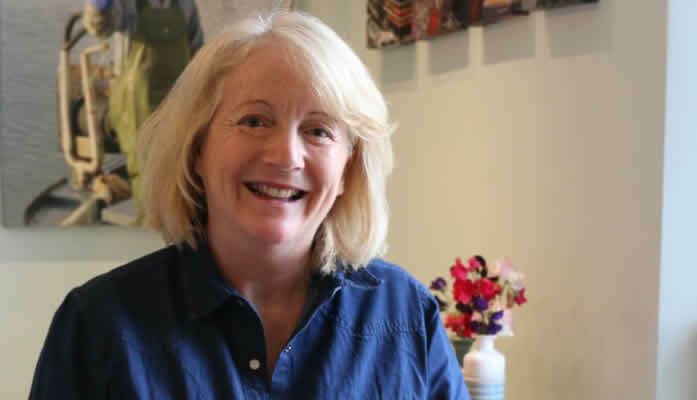 Click above to listen in to Eithna’s interview with Claire Ronan on Up & Running Business Show recorded on the train. 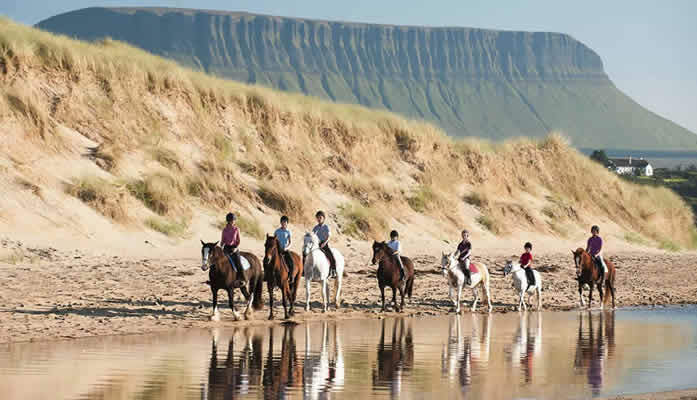 href=”http://www.islandviewridingstables.com/”>Island View Riding Stables brings you on superb friendly horses and ponies to hidden golden beaches below Classiebawn Castle, Mullaghmore. This walk takes approximately 1 hour. Starting at Eithna’s Restaurant, walk north away from the village in an anti-clockwise direction, with the Atlantic on your right hand side. Follow the road all the way round Mullaghmore Head, a peninsula (bordered by water on 3 sides). Take in the breathtaking waves rolling against the rock edges, look out for breeding pairs of Fulmar and seaweed-covered rocks favoured by oystercatchers, turnstone and the elusive purple sandpiper. During westerly winds manx shearwaters, gannets and occasionally european storm petrels may pass offshore. If you’re into surfing, its here you’ll see international surfers riding the big waves when the weather conditions are right. As you pass around The Head, you will see the iconic Classibawn Castle with its imposing turrets silhouetted against the Benbulben sky line. 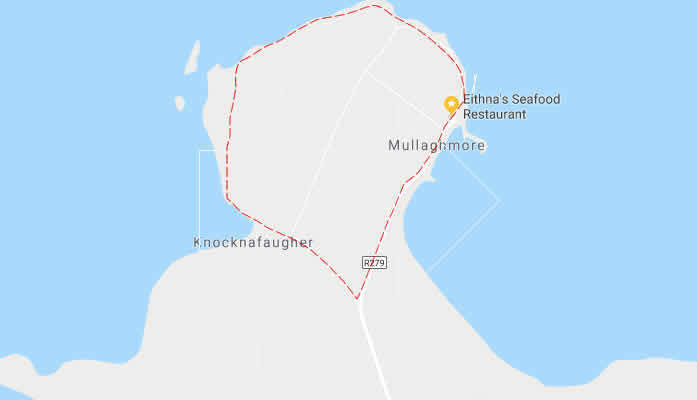 You will descend the hill and when you reach the main road into Mullaghmore, turn left and make your way back to Eithnas where a hot cup of coffee complete with Eithna’s homemade scones and jam can be had. Seacrest Guest House, Mullaghmore, Sligo. The closest B&B to Mullaghmore, beautiful location, sea views. Pier Head & Beach Hotel are both in Mullaghmore.